A group of sophomores prepare to play catch with a football at the Hotel Villas Rio Mar pool. After the morning activities, students ate lunch and had free time. 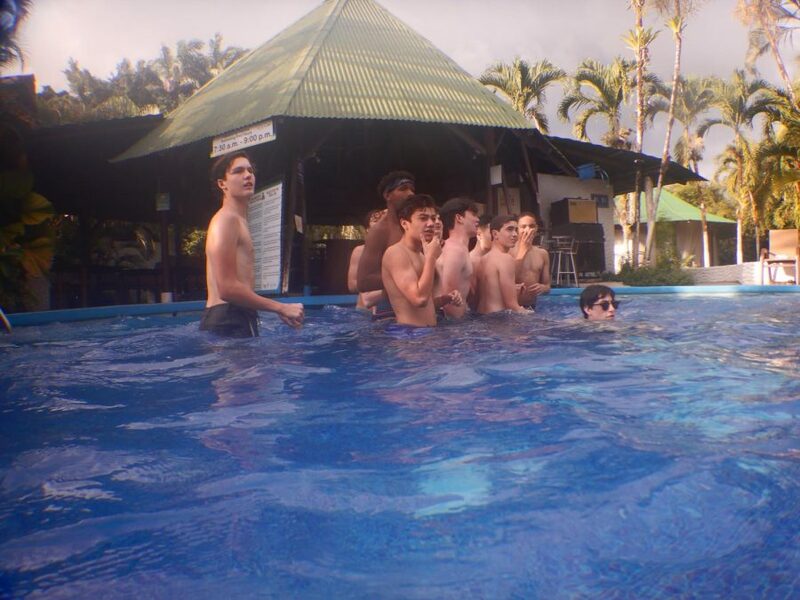 The sixth-annual Sophomore Class Costa Rica trip in mid January emphasized community through coed group activities, exposed students to a different culture, and taught them about conditions students face around the world. Convent & Stuart Hall students participated in outdoor activities such as horseback riding, swimming, ziplining, and surfing during the day. At night, they had chances to dance, participate in a talent show, and listen to live music. “Being outside of school with my friends in an environment where we had challenges like jumping off of a waterfall forced us all to grow closer to each other,” Convent student Driscoll Callan said. Although the majority of the trip revolved around outdoor excursions and activities, students say the day of service was particularly memorable. “Even though we were serving kids from another country who spoke another language, we still had a great time playing sports and trying our best to communicate with them,” Rodriguez said. Sophomores served at a local elementary school for one day by playing with the local school children, giving them school supplies, and helping them renovate their classrooms. “We were able to speak Spanish with them and just have fun playing sports and running around,” Alexander Ellis said. Sophomores say that they didn’t only enjoy playing with the Costa Rican students, but that they also learned a lot from the children.